It’s nice to know that while overseas in these lonely warzones, where the only way you’re going to get carnal knowledge is to either beg or pay for it; that I’m not the only one spending time pondering the Why’s and the How’s of life. I’ve once again found myself going over topics with a group of fella’s every night. I unlike other’s love to listen to people talk believe it or not. It’s why I’m so well-versed, and opinionative. I don’t just form my opinion from my own thoughts or things learned in school, but from others’ minds. Even though I think I’m better and smarter than each and every one of you, doesn’t mean that I don’t respect your opinion. Tonight, over sauteed onions and turkey wings, the fella’s were talking about men and their conquest for the holiest of holies. Not only that, but the relationships thereafter. I try on top of trying not to make all my blogs about relationships… and they’re not but the majority of them are. The point of “You Won’t Get 100%” is simple: We’re all walking through life, looking for someone. Whether we want to actually admit it or not. We may not be looking ardently, or daily, or persistently, but we’re looking. Unless you of course already have that someone. You may love that person with all your heart. KNOW in your mind body and soul that they’re the one. But they’re not the 100% we’d imagine. And that’s FINE. There’s SOMEONE that you’ve had better conversations with. There’s SOMEONE you’ve known who was more considerate. There’s SOMEONE you’ve known who was more professionally competetive. There’s SOMEONE you’ve known who made more money. There’s SOMEONE you’ve known who was more sensitive. Yes indeed, the person you’re with may be the one for your but there was/is someone that did/does/has at least one thing better. 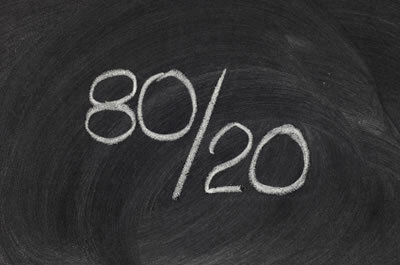 As in that HORRIBLE, yet strangly entertaining Tyler Perry film; the law of 80%-20% is a very real thing. The one you’re happy with now is the 80% (or 75% or 95%) and the person you had before, are lusting over, are looking at having an affair with, or are leaving your 80% for is the remaining balance. I’m not going to go too deeply into this because I’ll start rambling and I wasn’t even supposed to be writing this blog anyway. Stay focused. And beware, that remaining balance might just be all you get. You’ll be trading in all that good for a little good and a lot of bad. When looking for that person you want to try and stay with. Keep in mind EVERYTHING isn’t going to be 100%. I know someone that has a boyfriend who complains about what type of pants she wears, and the frequency in which she wears them! I broke up with a beautiful Korean girl because she’d gained 10 pounds since I’d been with her. I’m not saying don’t be picky. But definitely be realistic. Look at yourself. Do you think you’re completely flawless? Do you think maybe you could shed a few pounds? Maybe make a little more money? Maybe have less gold teeth? I don’t know… You deserve to be in a relationship though! If you’re in one, and you’re nitpicking about every little thing you can find, you’re either looking for an unattainable 100%, or you simply do NOT want to be in that relationship. You’re shooting yourself in the foot. You’re going to end up with someone that has more negative qualities than the last person you were with, and you’re gonna be regretting losing her/him. Just keep it in mind. It’s a hard thing to know that EVERYTHING won’t be perfect, but also know that you shouldn’t settle. At the end of the day, the difference in the two should be clear.